Amber (of Amer, as the Indians pronounce and spell it) is the fortified residence of Raja Man Singh in the northern suburb of the city of Jaipur, which has the same name, situated on the ridge of a rocky hill behind the Maota Lake. Once there was a river in front of the citadel, but now there is only the dry riverbed left. 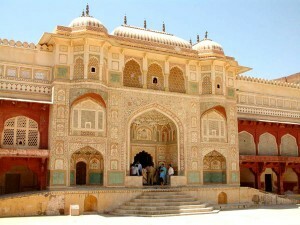 Amber Fort is justifiably the most significant sight in Jaipur. In fact this is a fortress with numerous palaces inside it. 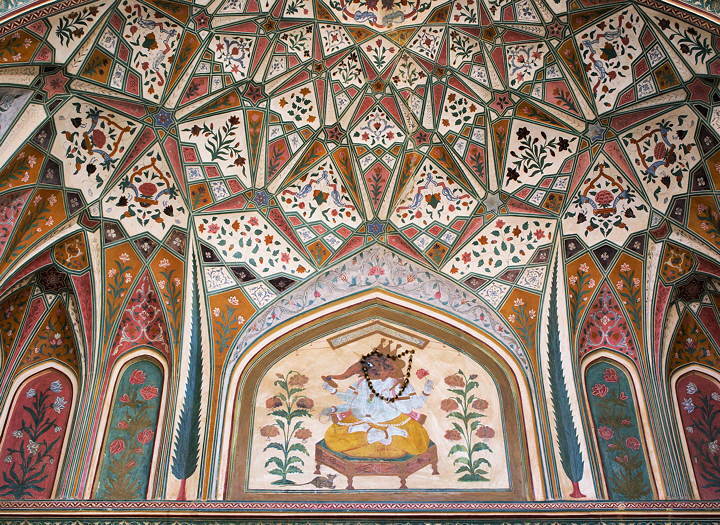 Man Singh, one of the first war chiefs of the Emperor Akbar, began the construction of a fortress-palace of red and white sandstone in 1592. Nearby he ordered to set a small temple devoted to Kali, his patron goddess. 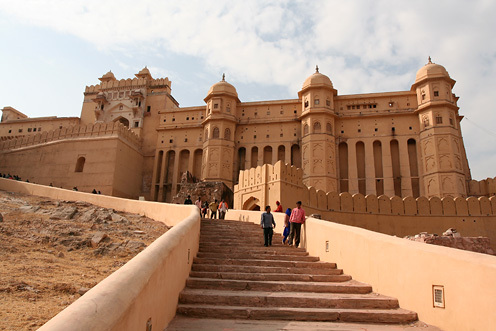 Before Maharaja Sawai Jai Singh began to rule here and founded Jaipur, it was the center of the principality. This place was used as a seat of the rulers and as a fortification. 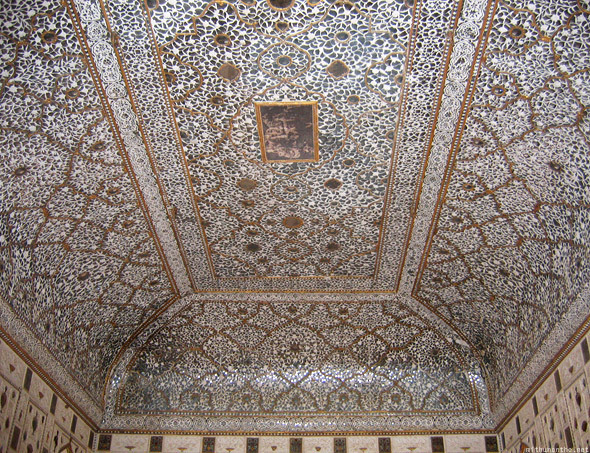 In spite of its formidable look, the inner rooms of the Amber fortress impress with their refined and spectacular decorations in the style which was characteristic of Mogul architecture. Still, in contrast with the Agra Fort and Fatehpur Sikri, the palaces of the fortress are more close to the Hindu architectural style. The sculpture of Ganesh which is carved from a whole piece of coral is really amazing, as well as the room of thousand mirrors which can be lit by a single candle. The citadel is surrounded with impressive walls, and it is said that their total length is more than eleven kilometers. Still when you are looking at them, it seems that this distance is even bigger. Additional forts are built in the highest and most significant parts of the outer wall. Even now one of these forts serves as a military station. At the foot of the fortress a beautiful park is situated, and from the citadel there is a wonderful view of hanging gardens, as well as of the settlement of Amber itself. A long serpentine road is leading to the fortress, which leads through several gates. Tourists usually get inside on elephants. There is a special office where you can book an elephant. It is predictable that there are lots of those who wish to do it, so the queue is usually really big. Each elephant once was painted in bright colors, but they have faded now. All of them have their own numbers, just like a taxi, and tourists use special stands in order to get onto the elephant’s back. They say it is not as hard as it may seem. Still the procession of elephants going in the direction of the fort is much bigger than that that coming back. It is a mystery, but maybe it is due to the fact that sitting on an elephant you rock yourself to and fro and by the end of the journey you might be even glad that it is over at last. As for the fort itself, as you enter you see the enormous square, which seems to be even greater from the top. After coming upstairs, you find yourself in another square, also a very big one, but smaller than the first one. 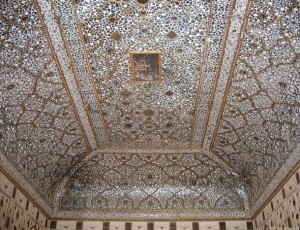 Everywhere your glance is attracted withby delicate carvings, but they are not the main adornment of the fort. 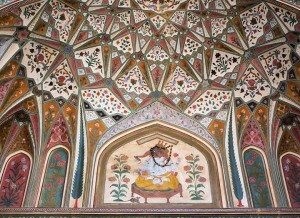 Wall paintings are more common here. This is what really surprises and amazes the tourists from all over the world who come to Jaipur every year to see this jewel of India.